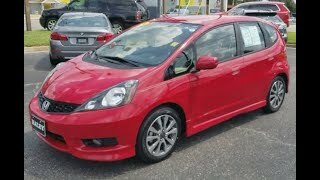 In case you're on the lookout for an affordable and well equipped small hatchback then the Honda Fit Sport 2013 might be what you're looking for. 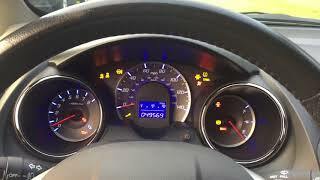 The 2013 model brings new improvements and updates on top of the already heavily update 2012 model, while trying at the same time to remain an affordable option in this segment. 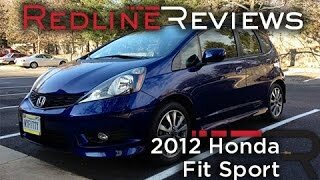 Despite its lower price tag of $15,325, the Fit manages to deliver class-leading safety scores, versatility and great fuel efficiency. Under its hood the new model comes with a 1.5 liter i-VTEC 4-cylinder engine that delivers 117 horsepower at 6,600 RPM and 106 lb-ft of torque at 4,800 RPM. The unit is mated with a 5-speed manual gearbox as a standard, but there's always the option of going for a 5-speed automatic transmission instead. Furthermore, the Fit Sport model is also equipped with a steering wheel featuring paddle shifters allowing for manual gear selection. Fuel efficiency for the automatic transmission mode is rated at 28/35/31 mpg city/highway/combined whereas the Fit Sport featuring automatic gearbox delivers 27/33/30 mpg. Models fitted with the manual gearbox are rated at 26/33/29 mpg. Speaking of the Fit Sport, let's take a closer look to this top-of-the-line trim level and what it brings new to the table. Included with this version are the set of fog lights, the 16-inch allow wheels, chromed exhaust, body-colored underbody kit and rear roofline spoiler, a 16-0watt six-speaker audio system, a new steering wheel with illuminated audio controls, upgraded seat fabric and metallic dashboard components, console ambient lights, floor mats and chrome accents on the dashboard. In addition the Sport version comes with a Honda Satellite-Linked Navigation Systemfeaturing Voice Recognition, Bluetooth, a 6.5 inch screen and 16 GB of internal storage. As for the aesthetic changes brought by the 2013 model a new color has been added in the list of options. The Midnight Plum Pearl exterior paint has replaced the Orange Burst Metallic and the side mirrors have been painted to match the color of the body. 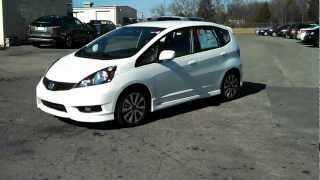 Inside the Honda comes with the trademarked rear Magic Seat that offers 60/40 split for enhanced cargo capacity. Safety features include Vehicle Stability Assist, ABS, dual-stage multiple threshold front airbags, Advanced Compatibility Engineering body structure, Occupant Position Detection System and more. 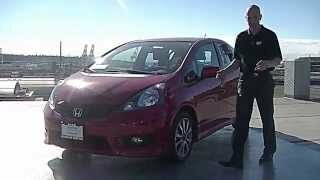 Overall the Honda Fit Sport 2013 does its job very good and delivers great price for value ration. If you'd prefer another alternative however, there's always the Volkswagen Golf or the Mini Cooper.